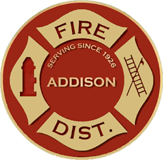 One of the most important missions of the Addison Fire Protection District is to protect the lives and property of the residents and visitors we serve through fire safety educational information and programs. Our goal is to reduce fires (and resulting fire deaths and injuries) through fire prevention activities and by identifying and rectifying unsafe behaviors. Fire safety is of critical importance because fires can strike anywhere at any time. The best defense to keep fire safe is a good fire safety offense. Follow these fire safety tips to ensure that your home and family remain safe, and that you have a quick method of escape from a dangerous fire situation.